Welcome to a Cutting Edge Maui Beach Home that blends its Original 1940's Plantation Style Charm with Refined Contemporary Design and custom finishes. 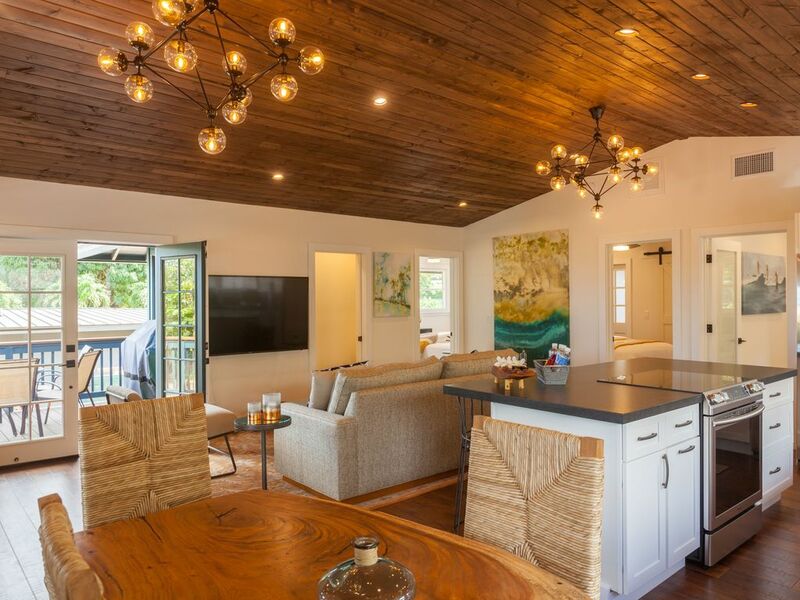 Located just steps away from sandy beaches on the desirable oceanfront Ili'ili Road, this romantic property mixes art, a variety of local woods, glass and natural sunlight, that quite simply, just make you feel good. The Ili’ili Plantation House is a modern Hawaiian Beach House, inspired by the tropical Maui landscape and historic surf culture. Personifying Kihei’s laid back beach-town community, the complete redesign of the original 1940s-era house has transformed the Plantation House into a contemporary boutique vacation rental that gives guests an unparalleled visit to Maui. Surrounded by lush, manicured landscaping, plumeria trees and fruit trees, each room has a framed garden view. Open sets of French doors and venture out into the private backyard or relax and barbecue on the dining lanai. Inside, the high-vaulted ceilings and original Plantation style windows create sun-filled spaces. The 12,000 square foot lot is expansive creating a magically intimate family oasis or allowing the entertainment of large groups. Clearly, this home is the epitome of indoor/outdoor living with three spacious lanais offering multiple lounging areas. The fully equipped kitchen features brand new full-size stainless steel appliances. A large kitchen island counter top and high stools are meant for casual dining. The open floor plan make social gatherings more relaxed and homely. A custom made dining table made from local Monkeypod wood seats six. All three ensuite bedrooms feature sliding barn doors separating bedrooms from the spacious bathrooms with walk-in showers. The master bedroom offers double French doors that open to the back lanai with two rocking chairs, overlooking the fenced in back yard, ideal for children to play in. The home offers comfortable accommodations for up to eight guests. The master bedroom has a single king bed that can also be reconfigured in to double twin beds upon request. Two more ensuite bedrooms each have a queen bed. A queen size sofa bed in the living room comfortably sleeps two adults. The furniture, fabrics and lighting fixtures lend to the authentic feel of a modernized Plantation House with its original 1950’s Hawaiian charm. Amenities include central air conditioning, hi-speed wifi, barbecue grill, initial Green Tea travel size shampoo, conditioner and soap in each bathroom, beach chairs, beach towels, boogie boards, a cooler and a beach umbrella. The Ili'ili Plantation House's prime location is conveniently tucked across the street from the beach, the popular surf spot known as the Cove, and just steps from Charley Young Beach.The gated property is within walking distance to grocery stores, restaurants, cafes, shopping plazas, nightlife, farmer's market and Kalama Park's running paths, tennis courts, beach volleyball courts, outdoor rolling skating rink, basket ball courts, skate park and jumbo playground. Ideal for the active and adventurous traveler, the Ili'ili Plantation House is steps away from Charley Young Beach- a white sandy beach ideal for sun bathing, swimming, surfing, snorkeling, diving, stand up paddle boarding, kayaking and whale watching. I'm a Developer and General Contractor on Maui, and I purchased the Ili'ili Plantation House in 2017. I'm passionate about building, design and architecture and I bring that passion to my vacation rental properties. My goal was to create a private villa for couples or large travel groups such as weddings, retreats and family reunions where everyone has convenient and easy access to the great surf and white sandy beaches across the street. The Plantation House is one of several vacation rental properties at Villas By The Cove. I look forward to meeting guests from all over the world and make it a priority to introduce myself when I'm on property. In my free time I time enjoy surfing, traveling, practicing yoga and spending time with my family. I welcome you as a guest at the Ili'ili Plantation House and I look forward to providing a memorable stay for you. Guests can enjoy a historic Hawaiian charm with the modern conveniences and comfort of the newly renovated property. The Ili'ili Plantation house offers accommodations for up to eight guests just steps from three of the best beaches on Maui's south side. Across the street from the property, the Cove Beach Park is the best spot on Maui for beginner surfing and stand up paddle boarding... And just down the street, Charley Young Beach is a favorite pick for sunbathing, swimming, boogie boarding, photography, whale watching, wedding ceremonies, and sunset strolls! Nearby restaurants, grocery stores, shopping plazas, salons, nightlife, golf courses, and Kalama Park's tennis courts, basketball courts, roller skating rink, large playground and running paths offer amenities and activities for all ages. Surf Schools, bicycle and scooter rentals, spa treatments and a farmer’s market are just around the corner. The Ili'ili Plantation House at Villas By The Cove takes its name from the unique location across the street from the Cove Beach Park, Maui’s popular surf spot frequented by locals and visitors. The house is surrounded by the lush tropical landscape of plumeria and palm trees, where the sounds of ocean waves and tropical breezes foster relaxation and serenity. Walking on the beach, swimming, surfing, snorkeling, shell-seeking, and whale watching are some of the daily activities just steps away from the property front gate. The property is located within a 5-10 minute walk to grocery stores, restaurants, shops, nightlife, farmer's market and coffee shops in downtown Kihei. Plantation Beach House guests have access to the Villas By The Cove swimming pool directly next door. All guests have access to our complimentary private Concierge service. Enjoy spectacular and memorable Maui sunsets every evening from the beach across the street, sweeping views of the Pacific Ocean, Maui coastline, and nearby islands of Lanai, Kahoolawe, and Molokai, and beautiful views of Mount Haleakala and the West Maui Mountains. So good! The perfect spot with all the charm! We were completely elated with our stay at Villas by the Cove. The Plantation house was absolutely perfect! The entire property was so clean and perfectly landscapes and manicured. The shared spaces and pool were great and so well done. Everything is brand new. Our house was so well equipped it’s hard to think of anything that was missing. The rooms were spacious with really comfortable beds. The bathrooms were fantastic with big showers and lots of fresh towels provided. The kitchen had everything you could need for cooking a big meal. There was a huge bbq grill and sitting patio with plenty of chairs to accommodate. The unit came with a storage container full of brand new beach chairs, umbrellas, two coolers, boogie boards and more. There was a huge washer and dryer to use so we were able to pack minimally and do washing during our trip. The owner/manager of this property was a DREAM. He was there to greet us upon arrival and took care of every need (which were few) The pride in the property showed and the customer service was impeccable. The house was quiet despite being in a bustling neighborhood right across the street from a popular surfing and SUPing beach. We spent the majority of our time at the adjacent beach with our kids who played in the waves, boogie boarded and looked for turtles. There were even small tide pools and a little cave which made for added time spent entertained. We basically camped out there the entire week... no reason to go anywhere else! The area the property is in felt so safe and comfortable. Great family spot. The house comfortably slept the 6 people in our group. We sat on the porch every night and enjoyed the most beautiful sunsets. Overall I’d give this place a 12/10. We will FOR SURE be back to stay at Villas by the Cove and thank you again to Shahaf for being so kind throughout our stay and for mailing my husbands forgotten clothes to us just days after we arrived back home. Truly a special place!! Great design for our party of six. Well furnished and convenient. Very comfortable. We loved our stay at the plantation house. This house was so perfect with three bedrooms and 3.5 bathrooms. So comfortable, clean and newly remodeled. The open concept kept everyone together while the front porch and patio allowed for separate fresh air retreats. We were across the street from our own private beach (most of the time) with a private gated entrance. One suggestion would be to have more couch space as it comfortably only fits about 4. Staff was very nice and quickly came running when needed. Great option for your relaxing vacation. This was my first trip to Maui and I'm so happy that we found this place! I don't know where to start but as soon as you walk in you will see the attention to detail that was put into this place. Each room has it's own bathroom and air condition control which kept us all comfortable. Since I had never been to Kihei I didn't know how great the location was until we got there. There are 3 great beaches a just across, or a few steps down the street and several restaurants, bars, and shops are just a short walk away. The house was stocked with everything that we needed for a great time at the beach. Shahaf gave us a tour to show us were everything was when we got there and helped us throughout the week. Thanks for making sure my family had a great vacation! Conveniently located on an oceanfront side street in the laid back beach town of Kihei, the gated property's prime location is steps from three white sandy beaches. Enjoy surfing and stand up paddle boarding across the street at the Cove Beach Park, Maui’s popular surf spot favored by visitors, locals and surf schools. Walk to nearby restaurants, shops, food trucks, a farmer’s market and nightlife.